Of all the ways I hoped I’d bring in these Holidays, I wouldn’t pick this one. Sure if Santa existed and really did make Christmas wishes come true, I’d change my mind. But Santa Claus is your parents. Oh those crazy elves! This time 20 years ago it wasn’t the same. I actually did believe presents were brought to our non-wintery home by mythical creatures from the North Pole. Our Christmas tree was outdoors It did not look like the tree in pictures and folklore. We would put pieces of cotton on the branches – and voila! We had snow! I can’t remember what presents I got but I do remember feeling adequately satisfied. This year it’s not about stuff. I find myself cringing at the thought of getting presents. As much as I enjoy being remembered, write me a letter dammit! Sorry, this Christmas spirit is overwhelming me. I would like to be a better person. Through it all, I felt a longing to know. Know when we would get to leave on our flight to Bombay and when I would get to sleep. It was as if we were moving and not going anywhere. Maybe it was jet lag but I don’t buy that stuff. I live on the edge. I also thought about Syrian refugees and I was sure they had worse things to worry about. They made it seem easy in my head. When we finally got home, I still hadn’t shaken that feeling. So I went on to lose my wallet with my driver’s licence and greencard. Now I have to figure out a way to get back into the US . No big deal. I have till March. If it doesn’t happen, I have a good life. Right. Now. We’re bringing in Christmas regardless and I might get many tiny note letter things (Thanks, Jane). Santa is my parents. And my family. And these experiences. This is a good year. Happy Holidays! My mother made this sweet to give to our neighbours on Christmas. It’s part of Goan (and Indian) tradition for people celebrating to give their neighbours of other religions sweets on festival days. It’s all part of building a closer-knit community and hence, it’s tres important. My mother didn’t shape the marzipan in the way they usually are (like miniature fruit) but that’s only because we’re very creative in this house. Put the cashew nuts in a medium-sized bowl and sprinkle drops of almond oil or essence on it. Mix well to coat and keep aside for 30 minutes to overnight. Break out the food processor and grind the almond-scented cashew nuts to a fine powder. Add the icing sugar to the processor and pulse until just combined. It should have a sandy texture. 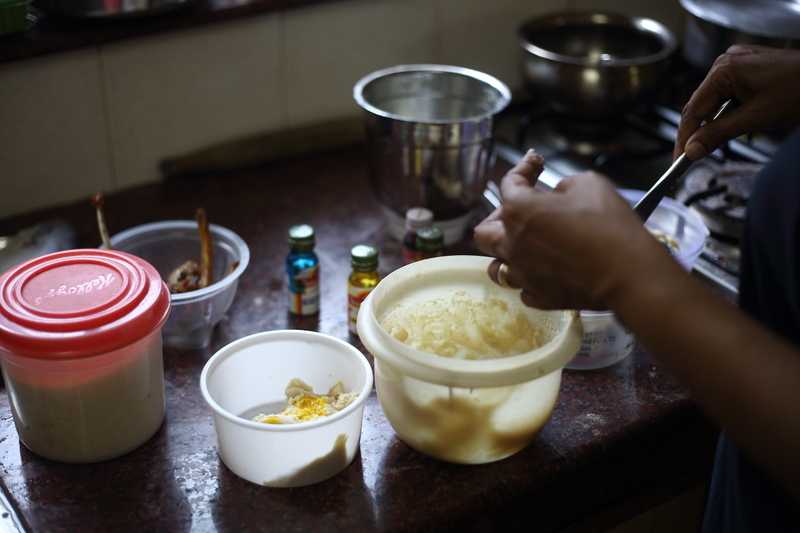 Transfer the mixture back to a bowl and add the egg whites, a little at a time. Use a spatula to combine the ingredients until you can easily form it into a ball using your hands. If the marzipan ball isn’t pliable, wait for about 15 minutes. It should start to set. 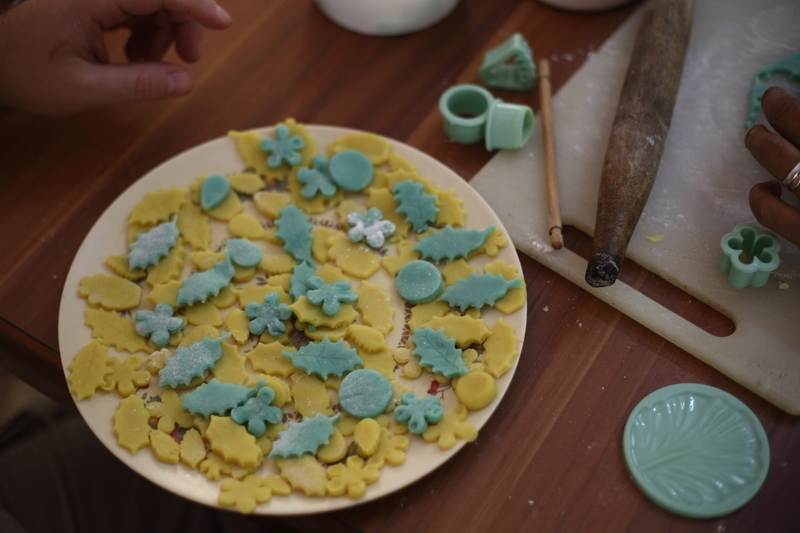 If it takes to long, dust a working surface with icing sugar and roll the ball of marzipan over it. Don’t overmix the marzipan as that could also affect the texture when the cashew nuts release their oils. 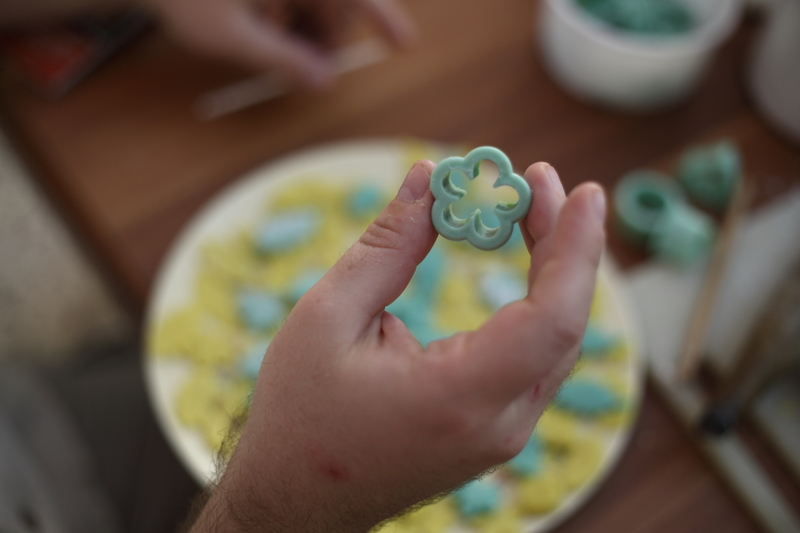 Divide the marzipan into parts depending on how many colours you will be using. You can also leave it without colour and it will taste just as good. 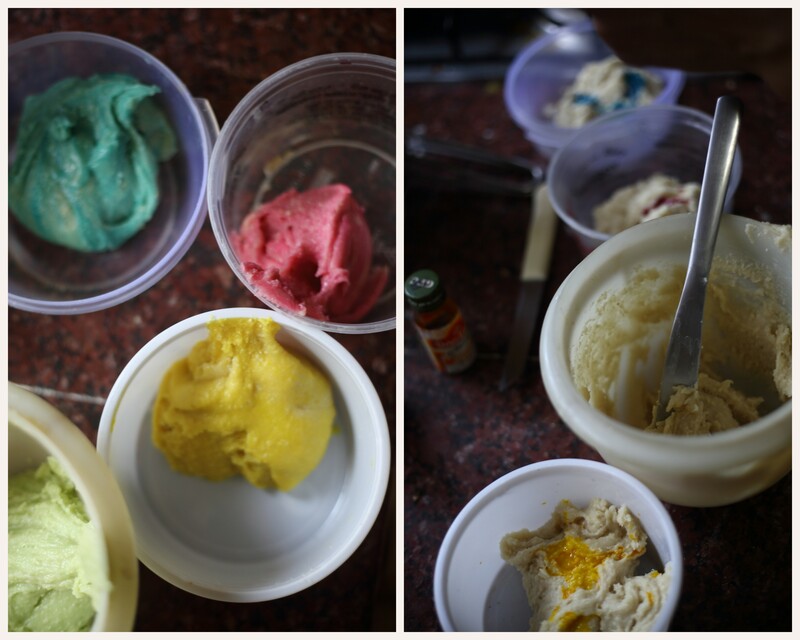 Add a drop or 2 of food colouring to the marzipan and blend it in. Form into whatever shapes you imagine. It’s like Play-Doh but edible!